Background Slider is an amazing feature provided by AnyWhere Elementor Pro. It gives you the ability to add a slider that runs on Section or Column background. This gives you complete freedom to keep adding your widget in that Section/Column. It works just like the background image, so you can put any other widgets inside that area as Slider is working in the background. It also has Dynamic capabilities. This means you can use the ACF Gallery field and use that field as a source of images. To add a background slider to a Section/Column, edit its settings and go to AE Pro -> Background Slider. There are two options available under Type. It defines the source of the images that will be used for the slider. Default: It is for static background slider. With Default, you will get the option to upload images just below it. Click on Add Images and it will open a WordPress media dialog to upload and select the images. 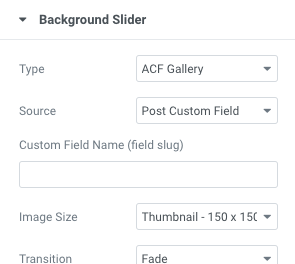 ACF Gallery: This option is available if you have ACF Pro plugin activated. 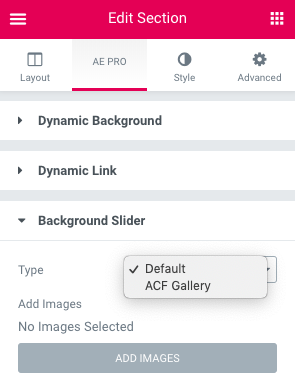 ACF Pro comes with field type - Gallery. Add the field name/slug in the below available setting field. You can also choose the Source. If you are creating it on Single Post Template then the source should be "Post Custom Field" and if you have created a custom field for Term and using this slider on Taxonomy Archive Template then use Source as "Term Custom Field". All other remaining options are for configuring the slider style and effects. Cover: Specify whether the image should cover the Complete slider or not.